We’d love your help. 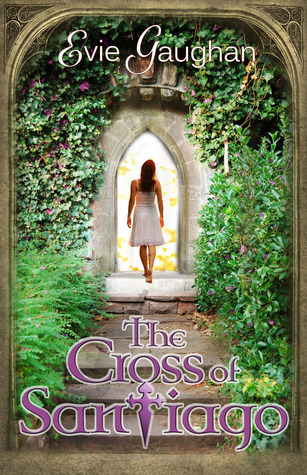 Let us know what’s wrong with this preview of The Cross Of Santiago by Evie Gaughan. A mysterious heirloom, once worn by a Knight of the Spanish Armada, holds the secret to a past life. When Amanda Morrison receives this unusual gift, it marks the beginning of an extraordinary journey into the past, which will challenge her beliefs and open her heart. To ask other readers questions about The Cross Of Santiago, please sign up. When I started my Green Giants (Irish Author Spotlight) feature, my hope was that I would help other readers find Irish Authors to enjoy. I didn’t realise that it would also introduce me to great writers that I might never have come across. Such as Evie Gaughan, who approached me to read and review The Cross of Santiago. She only had to mention the magic words, Galway and Time Travel, and I was in! My Thoughts on The Cross of Santiago: When I started my Green Giants (Irish Author Spotlight) feature, my hope was that I would help other readers find Irish Authors to enjoy. I didn’t realise that it would also introduce me to great writers that I might never have come across. Such as Evie Gaughan, who approached me to read and review The Cross of Santiago. She only had to mention the magic words, Galway and Time Travel, and I was in! This book has two settings and I loved both. The first is contemporary Galway – a small, vibrant city in the West of Ireland; a city that is full of fun and art, one I always love to visit. I feel the book really captured the tone of modern Galway really well. The second setting is the failed voyage of The Spanish Armanda fleet in 1588. This setting has won this book a place in my heart forever. If you know nothing about the Spanish Armada and how so many of the ships were shipwrecked on the coast of Ireland and Scotland; then worry not, this book will fill you in. I had forgotten so much of this part of history that it was fantastic to revisit it and I ended up having great discussions about the battle and their mission with my husband who is a history fiend. I kept imagining this part of the book as a film. The vision of the ships taking 2 days just to leave the port of Lisbon due to sheer numbers is such a spectacular image. I love books that engage your brain and make you want to research more which is exactly what this book did to me. However this book is not just a book about history (as amazing as the historical setting was); it is also full of intriguing characters. The main characters are Amanda and Xavier. And I have to say both of them have made some very dubious decisions in their lives and I find it hard to say which of their wrong turns I despise more. Despite that I can see how lost both of them are and how both are willing to grow and learn with a little guidance and inspiration from the past. Their ancestors from the sixteenth century are a different matter. A knight and a peasant girl; their morals and sacrifices shine through the centuries. Annora and Miguel seem to encompass everything that Amanda and Xavier should be but they also hint at the potential that they will blossom into. Overall, this book has a little bit of everything; an epic romance, adventure, great locations, well researched historical fiction and some dream interpretation. The mixture of the two stories leads to a snappy, well paced story that kept me excited and invested in the plot. And when I wasn’t reading the book, I was thinking about the book and talking about book; always a good sign! Who should read The Cross of Santiago? The Cross of Santiago is a heart-warming, astonishing novel of love and destiny. Even though it’s more than 350 pages, I finished it in just a few hours. The writing really pulls you in from the start, and it doesn’t take long before you start to care about the characters and the adventures they find themselves in. Amanda Morrison longs for something more than her current life. After a series of failed relationships, she’s long lost her belief in true love. She’s dating a man named Connor, but he’s egotistical and full of self-importance. Xavier is an adventurer and traveller, the kind of guy who can’t commit to anything else and does what he wants whenever he wants to. At first, it seems like the two of them are miles apart, both in view on life, and in position on the planet. But when Amanda’s aunt, who she didn’t really know, leaves her a mysterious golden cross in her will, Amanda’s life is turned upside down. She crosses paths with Xavier, and it’s like a piece of destiny unfolds. Amanda goes on a journey to discover the truth about her family’s past, and Xavier decides to tag along, but no journey is without strange adventures. The kind of things Amanda and Xavier encounter are as amazing and creative as the Odyssey. Really. Half of those things, I hadn’t seen coming at all. The book is a bit complicated because of the time jumps at the start, from summer 2010 to autumn 2009 to spring 2010, etc. I wish the start of the book would’ve been told in a chronological order. It would’ve made more sense, and it wouldn’t have slowed down the pace that much. Now I had to pause, rewind, and then rematch the pieces of the story. Amanda was an interesting character. She didn’t show a lot of spine at first, and she put up with Connor’s crap, which was a stupid idea to begin with, since he was an arrogant prick. But as the story progressed and she discovered more about her family’s past, it was like she discovered herself as well, and she was a lot stronger than she gave herself credit for. I also liked the time slip, and the historical setting. All settings were well-described, and I got the sense I was really there. I enjoyed reading this book! I like the idea of jumping between different centuries and stories, and I think Evie Gaughan does a good job building the characters and revealing their stories, past, connections, etc. It also make me very curious about Galway and all the surroundings; I recently moved to Ireland, so having the opportunity to read about new places and finding out more about their history is always interesting to me. The only thing I received this book in exchange for my honest review. The only thing I felt would have make this book a little better is the pace at which the events happen. At the beginning it takes too long to get the connection between characters, and it feels like they will never meet each other, and then suddenly everything develops too quickly. Also, there are quite a few spelling mistakes, and would recommend the autor to get some Spanish native to review the spanish sentences, being spanish myself I noticed some of them didn´t make sense, or wouldn´t have been said by a native from Spain. Truthfully, I hadn’t heard of this author or book before but this is one of the best debuts I’ve read in years. The story was perfection. An instant favourite. Being from Ireland myself and this being set on the West Coast of Ireland (which I love) made it all the more real and charming. From the descriptions of the West to the various nods to Irish language and culture, this book appealed to me in a way that many other books just can’t. As historical fiction goes, I enjoyed the modern day aspect Truthfully, I hadn’t heard of this author or book before but this is one of the best debuts I’ve read in years. The story was perfection. An instant favourite. As historical fiction goes, I enjoyed the modern day aspect to this read. By a few chapters in I was sold on the contemporary story line, but it wasn't till I was probably past the halfway point that I really started to enjoy and appreciate the historical fiction. With contemporary romance novels sometimes I feel more stupid after reading them. In contrast, after reading this I felt I had learned a huge amount about Ireland and its history that I’m ashamed to say I didn’t already know. The writing was eloquent with many well-turned and punchy phrases. At no stage did I find the writing style too wordy. I’d imagine this book would appeal to a multitude of people. It’s contemporary, there’s romance, there’s history. The characters are diverse, likeable, relatable and there are a good few witty lines (I laughed out loud on a few occasions). The chapters were fairly short too which was a bonus as it somehow makes me read quicker. I would most definitely encourage readers to take a chance on this author. I was pleasantly surprised, as I’m sure you will be. I look forward to reading Evie Gaughan’s other books and this has motivated me to read more books by Irish authors next year. Slow start, but picks up nicely. For me, the beginning of the story was slow to get into. I think it picked up when Ms Gaughan introduced the 1588 events. Then to follow the growing relationship between 1588 and 2010 characters and events. The strongest characters were the females. Miguel was a nice gentleman, but seemed to be a knight more by inheritance than proven valour. When crisis came, Annora was the stronger leader. Finally, though Annora and Amanda had many similar traits, they seemed su Slow start, but picks up nicely. A story of the past finally completed in the future. Those that like historical romance will enjoy this book. Beautiful story of of an Irish lass and a Spanish Knight from the Armada which crashed on the shores of Ireland. A devastating hurricane brought the 2 together when the Spanish were trying to defeat England in 1500's. Fast forward to the present day and how an heirloom unites their fate. This book has a great true historical background. Good read. I choose this rating because all together it was a fascinating story combining history within the current day. I admired this aspect of the book entwining the theme through the couples' stories of love, loss and healing. Since I have visited Galway, the book brought familiar sites to mind which made history come alive. I'm glad I found this book and would recommend it to a lover of Ireland, history and romance. Do you believe in reincarnation? If so, you will love this love story that goes back to Ireland and the wrecked ships of the Spanish Armada. It is the story of modern day Irish woman, Amanda, and Spaniard, Xavier, who seem to know each other even before meeting. Interesting premise and decent reviews but I just can't get remotely interested in it. Life is too short to force myself to read something that is supposed to be fun. This is a novel where the past life mirrors the present. In the present, the characters were well done and I really wanted to follow their story. In the past, though, the story read like a textbook. Way too much dry information for me to care about the characters. The apostrophe and its misuse is distracting. A number of times the word "taut" was replaced by "taught". This was such a wonderful story. It is well written and the imagery is sublime. I look forward to reading more books from this author. I did not finish this book as it was too slow and was hard to follow. The story line was didn't seem to make sense to me. This was a perfect guilty pleasure book to read. I love that it was written and set in Ireland. It was a fun diversion from reading books for work. The book was very enjoyable. It has romance and mystery. Hopefully there will be other books written as we do not know how the cross was passed down. A well written story of love through the ages. I was eager to see how the various characters would all come together at the end. It made me sigh with a smile at the end. I enjoyed this book, but the number of errors was startling and an almost constant interruption to the flow of the story. Spell Check is NOT the answer to everything! I received this book in exchange for my honest review. Thank you Itching for Books and Evie Gaughan for giving me the chance to read The Cross of Santiago. This is the second book I ever read that it this genre. I’m not a big fan of historical fiction, but I loved this book. I appreciate it even more when I saw that the author self published. I have a great appreciation for authors who have the courage to do this and they always have amazing books and incredible stories. The Cross of Santiago fol I received this book in exchange for my honest review. Thank you Itching for Books and Evie Gaughan for giving me the chance to read The Cross of Santiago. This is the second book I ever read that it this genre. I’m not a big fan of historical fiction, but I loved this book. I appreciate it even more when I saw that the author self published. I have a great appreciation for authors who have the courage to do this and they always have amazing books and incredible stories. The Cross of Santiago follows the story in Galway in the sixteenth century and in the present day. Evie recreated the city perfectly, making me think I was there. The adventures in this book made me stay put and read it all in a heart beat! One of our characters Amanda Morrison doesn't have any luck in love. She had a couple of bad relationships with not even a remotely chance to a happy ending. She feels the need for someone to love her, but she lost any hope in finding anyone. She lost her hopes even more, when she dated Connor, a man who doesn't appreciates what he has next to him. Amanda meets another man, Xavier, but he is the type of man who loves his freedom and does what he feels like it. She never thought in a million years that they will ever have a chance. But, after a while, Amanda finds out that she inherited a mysterious golden cross from an aunt that passed away. Is it luck or misfortune? After the little fortune she inherited, her path with Xavier comes together. So, Amanda decides to take a journey to find out more about her family pasts, especially after Xander decides to come along and help. From that point, they’re trip turns into an adventure, and what adventure it was. I liked the fact that I had the chance to discover Amanda growing up with her along, to say so. It was an interesting read, one that I would happily read again. Thank you for the chance. I recommend this book, especially to those who appreciates a good historical writing. Honestly, this book got off to a bit of a slow start, but it picked up quickly and I am glad I got to review it. This book follows Amanda, a young woman who was orphaned as a child and hasn't yet set a good future path for herself. She finds herself in possession of a very unique medallion that brings about many changes in her life. She soons finds herself on a new path. A path filled with history and intrigue. This book had a lot of mystery. I was adopted and so I can relate to Amanda as a charac Honestly, this book got off to a bit of a slow start, but it picked up quickly and I am glad I got to review it. This book had a lot of mystery. I was adopted and so I can relate to Amanda as a character. She wants to know about her past, about her birth family, and her family's history. I have been there and so this book was a good read for me because I could REALLY relate to her. I think books that the reader can relate too are the best kind. They help you feel that the story is more REAL, rather than it just being a story that is being read. The Cross of Santiago belongs in several different genres which makes it interesting. It starts out with Amanda, the main character, being in a relationship with a married man and not doing much with her life. Once she receives the Cross of Santiago from an aunt she never knew, she begins to change and she realizes she’s on a track to nowhere. I enjoyed watching Amanda grow as the story progressed. It seems the more she delves into the past I received a free copy of this book for an honest review. I enjoyed watching Amanda grow as the story progressed. It seems the more she delves into the past of her family, the more she matures and finds herself. The other characters were interesting. One I especially liked was Chris and his hypnotherapy and as Amanda said, “What a hippie.” Evie Gaughan also has a good sense of humor that shows through her characters. I was certainly intrigued by the different plot threads which Evie Gaughan evolves in The Cross of Santiago, but the pace of the story is relatively slow and I found myself growing impatient for characters to meet and events to occur. I have never read a story like The Cross of Santiago and Evie Gaughan's attention to detail is amazing, particularly when writing about the historical part of the story. She combines the different areas of the plot in a way I was unprepared for and found especially I was certainly intrigued by the different plot threads which Evie Gaughan evolves in The Cross of Santiago, but the pace of the story is relatively slow and I found myself growing impatient for characters to meet and events to occur. I have never read a story like The Cross of Santiago and Evie Gaughan's attention to detail is amazing, particularly when writing about the historical part of the story. She combines the different areas of the plot in a way I was unprepared for and found especially emotional. To know one soulmate, but not to know one yourself,that was the story of Amanda and Xavier life. Amanda was adopted and lost in this world having no tries to her biological family. Xavier was just sailing thru life one contest after another, they had two things in common, they both had no past and they could feel a connection to the other. Most of this story take in the 1500s so if you love historical romance, adventure and humo I was given this book by the author in exchange for an honest review. Amanda was adopted and lost in this world having no tries to her biological family. Xavier was just sailing thru life one contest after another, they had two things in common, they both had no past and they could feel a connection to the other. Most of this story take in the 1500s so if you love historical romance, adventure and humor you will be laughing your way to the end. Evie Gaughan is a writer and artist living in Galway City, beside the sea. Her books are a mix of genres, incorporating her love of history and a penchant for magic in the everyday. The Heirloom is Evie's debut novel and is a time-slip epic set in Ireland during medieval times, with a parallel story in the present day. Her second novel, The Mysterious Bakery On Rue De Paris is a magical tale set i Evie Gaughan is a writer and artist living in Galway City, beside the sea. Her books are a mix of genres, incorporating her love of history and a penchant for magic in the everyday. The Heirloom is Evie's debut novel and is a time-slip epic set in Ireland during medieval times, with a parallel story in the present day. Her second novel, The Mysterious Bakery On Rue De Paris is a magical tale set in France, with a heart-warming cast of characters. Her upcoming novel, The Story Collector, is due for release in Autumn 2018 with Urbane Publications.